ME ENCANTA ESTA FOTO QUE TIENE MÁS DE CINCUENTA AÑOS. 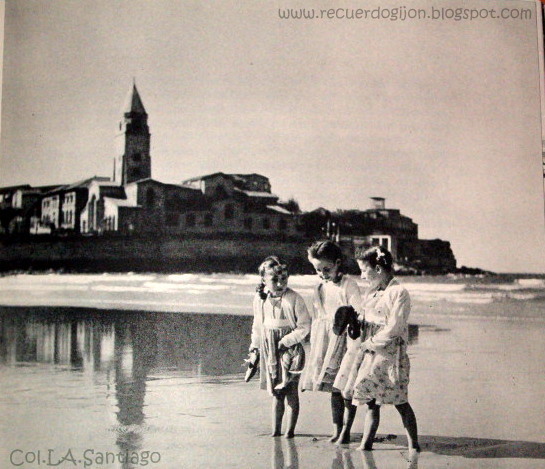 PARA L@S NIÑ@S DE GIJÓN LA PLAYA SIEMPRE HA QUEDADO MARCADA EN NUESTRO RECUERDO POR MUCHOS MOTIVOS. LA ARENA, LAS HORAS DE LA DICHOSA DIGESTIÓN, LA TEMPERATURA DEL AGUA, EL COLOR DE LA BANDERA QUE TOCARA, LA PLEAMAR O BAJAMAR QUE NOS SORPRENDÍA, LA MEGAFONÍA Y SUS ANUNCIOS, LOS VENDEDORES DE BEBIDAS, LOS CONCURSOS DE CASTILLOS DE ARENA, LA NUBE QUE VIENE, EL NORDESTE QUE NO SE VA, EL NO PERDERSE..., EN FIN COMO ESTOS CADA UNO Y UNA SUMARÁ MUCHOS MÁS RECUERDOS. TIJERA. SIN SER ÉSE EL JUEGO DE LA FOTO SÍ ME HA RECORDADO LA MULTITUD DE EJERCICIO QUE HACÍAMOS CON LOS JUEGOS DE LA CALLE O EL COLE. HAY QUIEN DIRÁ QUE AHORA NO SE VE A LOS JÓVENES JUGAR ASÍ, EVIDENTEMENTE LOS TIEMPOS CAMBIAN AUNQUE ME PARECE MÁS SANO ESTE TIPO DE DIVERSIÓN QUE NO VER A LOS CRÍOS CON LAS MAQUINITAS ESTÁTICOS Y DÁNDOLE AL DEDO. YO HE VISTO EN LA ZONA DEL CARMEN NO MENOS DE 6 A 8 NIÑOS CON ESTA ÚLTIMA ACTIVIDAD, TAN SOLITARIA Y POCO SOLIDARIA Y , CON TODO EL RESPETO DEL MUNDO Y TOMANDO EL SLOGAN DEL ANUNCIO , CREO QUE LA JUVENTUD HA DE SER VIVA , ALEGRE Y LLENA DE COLOR DE ALEGRÍA EN SU ROSTRO REALIZANDO UNA ACTIVIDAD EN LA QUE INTERACTÚE RELACIONÁNDOSE CON SUS IGUALES. 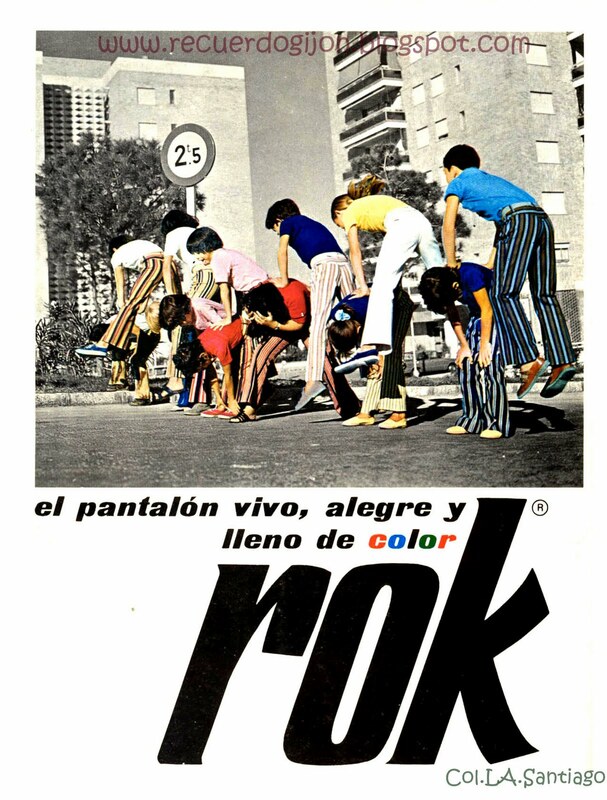 LA FOTO DE LOS 70 PARECÍA UN ANTECEDENTE DEL PHOTOSHOP POR EL CONTRASTE DE COLORES.LOS "ROK" LOS RELACIONABA MÁS CON VAQUEROS QUE CON OTRO TIPO DE PANTALONES PERO AHÍ SE PUEDE VER LOS MODELOS DE LA ÉPOCA. 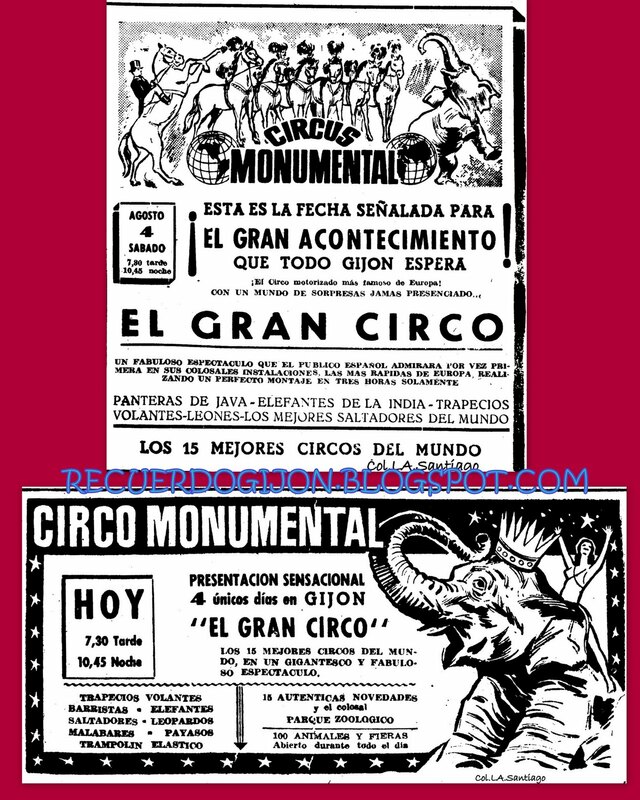 PARA MÍ IR AL CIRCO DE GUAJE ERA IR A LA ESPLANADA EN DONDE SE CONSTRUYERON POSTERIORMENTE LAS "TORRES SEDES", EN PUMARÍN. 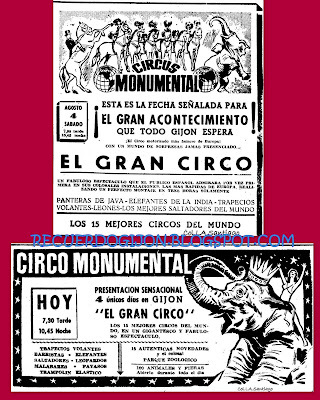 ALLÍ SE MONTABAN LOS CIRCOS DURANTE UNOS AÑOS. AQUELLOS CIRCOS CON VARIAS PISTAS, CON PISTAS DE HIELO Y CON UNOS ZOOLÓGICOS AMBULANTES QUE NOS PARECÍAN GIGANTESCOS. AUNQUE MUY VAGAMENTE EN EL RECUERDO HUBO ARTISTAS QUE VÍ ENTONCES Y QUE FUERON TODA UNA LEYENDA COMO PINITO DEL ORO. 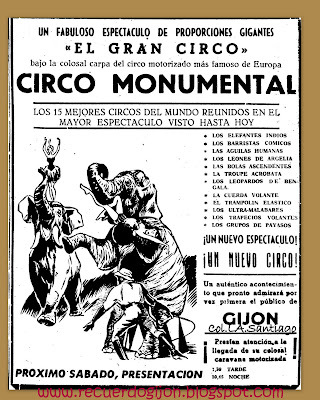 AL LEER LA PUBLICIDAD ME QUEDO CON LA INCÓGNITA DE SABER QUE ERAN LOS "BARRISTAS", QUÉ HACÍAN LAS PANTERAS DE JAVA, LAS ÁGUILAS HUMANAS, LAS BOLAS ASCENDENTES Y NO OS DIGO NADA DE LOS ULTRA- MALABARES. 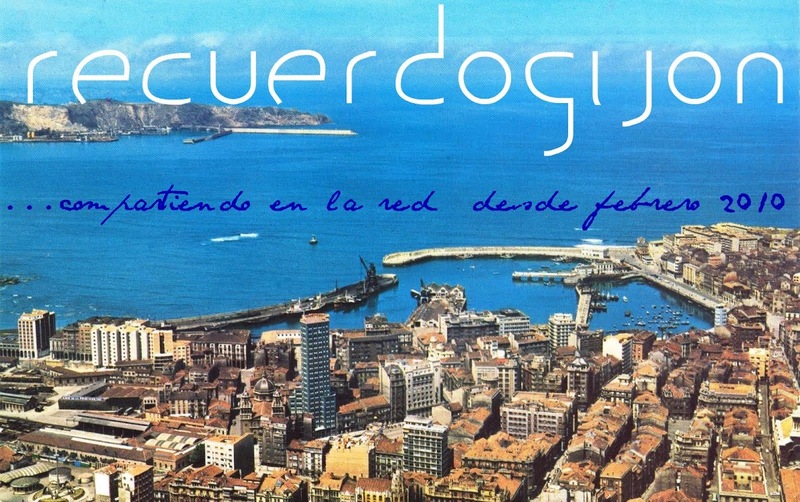 AL PASAR EL DESFILE POR GIJÓN SIEMPRE LE TUVE UN PELÍN DE REPARO AL QUE IBA EN ZANCOS CON PANTALONES DE 3 METROS A DOS COLORES Y QUE IBA DE GRACIOSO.